At This Age group turns experience into radio play, published on Sunday, April 26, 2015 The Morning Star in Vernon, BC. At This Age group turns experience into radio play and based on Manfred Harter’s song that inspired the play is a tribute to Canada and its citizens. 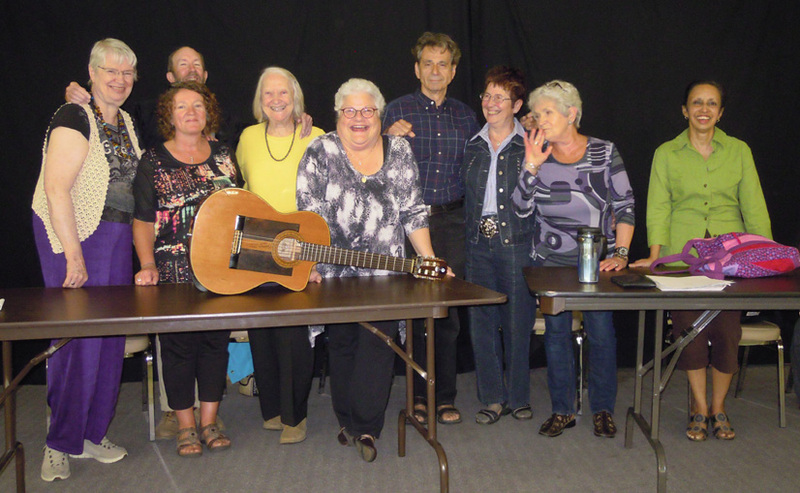 The group called ‘At This Age’ is based in Vernon, BC, a town with a quarter of its 50,000 residents are over the age of 65. The group is made up of seniors who take the initiative to improve their quality of life by being involved in intellectual activities with a focus on the visual and performing arts. The group was formed last year on July 15, 2013 with the help of Dr. Dalia Gottlieb-Tanaka. Approximately 60 people have visited the program on a drop-in basis. However, there is a core group of approximately 12 people who participate in the program on a regular basis. Their activities can be followed on the Society’s facebook page: The group meets weekly on Mondays for 4 hours. The topics vary from designing wedding dresses for Barbie dolls and writing poems to creating play performances. Members of the group established new friendships based on a mutual interest in protecting and stimulating their brains in an effort to postpone early onset of dementia. Science has proven that being engaged socially, learning new information, as well as adding interest, joy and excitement in life, has the potential to postpone the onset of dementia by two years. So what should stop you from trying to do that too? Do a favour to yourself and get involved! The play is called “The Zen of Aging - Squaring the Circle” since it is about the total togetherness of body, mind and soul. “Squaring the Circle” is about breaking the notion that older people are less likely to stay creative as they age. Science claims that being engaged in the creative arts would postpone the development of Dementia. The actors (age 65 to 87) belong to a group named “At This Age” which meets once a week for three hours. This play is a re-enactment of parts of our weekly meetings. The script is based on Reminiscing, Storytelling and Poems the group wrote in the months leading to the play. The group is self-led with the help of Dr. Dalia Gottlieb-Tanaka. Dalia is the Chair of the Society for the Arts in Dementia Care that originated in Vancouver, British Columbia, ten years ago and now has affiliates across Canada and in Australia. We had plenty of help along the way. Jeanne Sommerfield, a member of the Board of Directors of our Society, was instrumental in directing the play, Mineo Tanaka, another Board Member was in charge of the sound system, Schubert Centre provided the space in-kind, and some members, who did not appear on stage, contributed to the script. We are now working on a radio play.Stay tuned. Feel free to distribute this clip. At This Age is a group of active, healthy older adults interested in continuing to stimulate their brain, memory, self-confidence and interest in life. It is group-led by its members since July 15, 2013. At This Age meets weekly at the Schubert Centre in Vernon, BC, Canada from 10:00 am to 1:00 pm. The group is facilitated by Dr. Dalia Gottlieb-Tanaka and is based on her research and that of other scholars in the field, who advocate that being engaged in the visual and performing arts is beneficial to the quality of life of older adults, whereby reducing depression and the number of visits to the doctor, as well as allowing new skills to develop. Every week, a group of seniors gets together in Vernon. They dance, they sing, they draw. They even wrote and staged their own play. This week, they listened to music. Organizers say creativity delays the onset of dementia. Have a listen. their Facebook page regularly with current events.